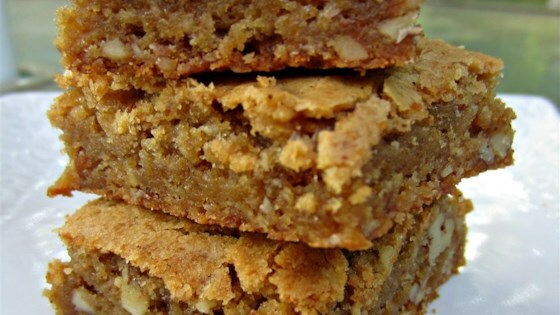 "These chewy squares ooze brown sugary butterscotch. They becrumb the lips and besmear the chin, like home-baked goodies should." Melt 1 cup butter in a large saucepan. Add 2 cups light brown sugar and beat well to mix. Cool the mixture slightly, then beat in eggs and vanilla. Sift together all-purpose flour, salt and baking powder. Stir it into the wet ingredients, then add the nuts. Mix well. Spread batter in a greased 11 x 7 x 2-inch pan and bake for 30-35 minutes or until a light gold. Cool in the pan for 10 minutes, then turn out of pan and let brownies finish cooling on a rack. To Make Frosting: Disolve coffee in the water. Cream 1/2 cup butter with confectioner's sugar. Beat it until light. Beat into the sugar mixture. Spread over the brownies. When frosting has set, cut brownies into squares. Enjoy! First of all, these are not brownies. They taste like a flattened cake. It was not even a good tasting cake. This receip came out HORRIBLE!!! It was more like a cake rather than brownies. I was very disappointed. In fact I threw out the whole thing!